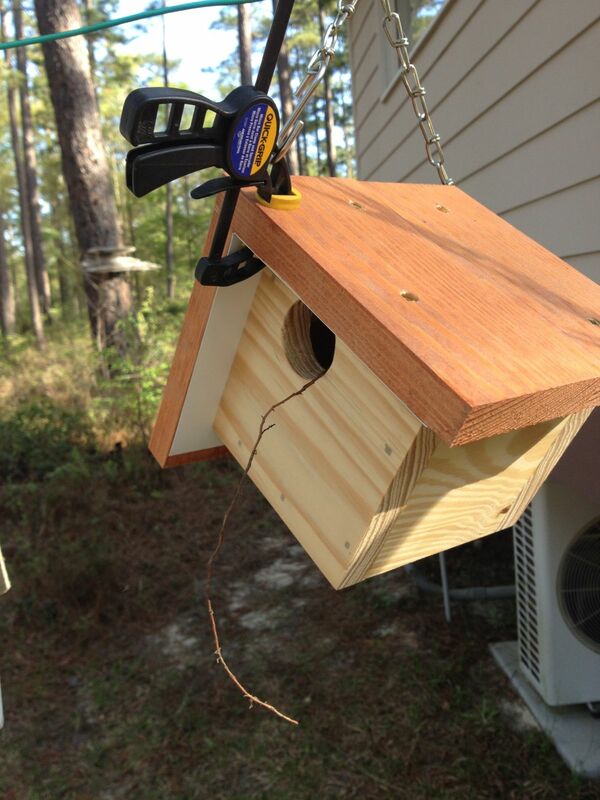 Spasms of Accommodation: Are Birdhouses Hot This Spring? It's nesting season in Beachton. 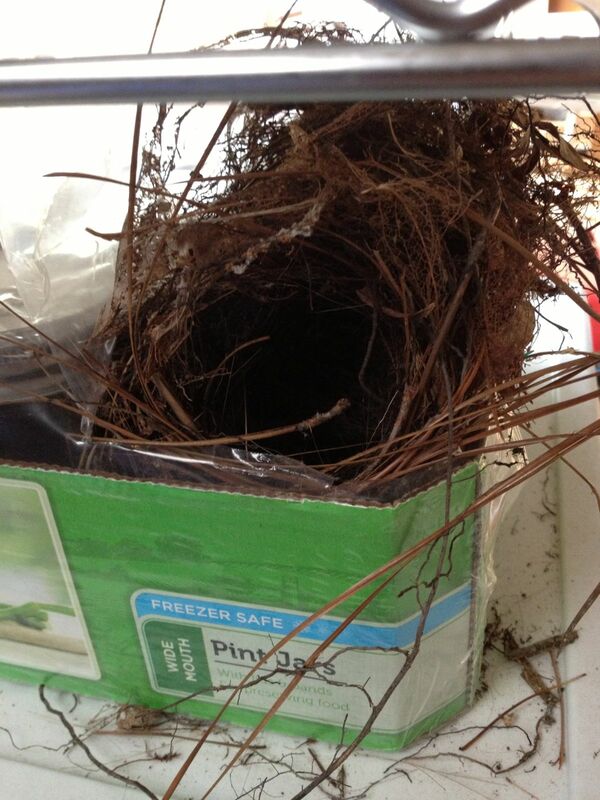 Carolina wrens are building nests anywhere and everywhere. Now, I'm a big fan of a bird that eats spiders, but sometimes they build their nest where I think it's a downright bad idea. What if I want one of the 11 jars that are still in this box? When it rains the eggs wash out the scupper. I have a video of a snake crawling under here. In light of the wren's rather poor choice of nest locations I try to encourage them to nest where I want them to, hopefully as near as possible to their indicated preference. 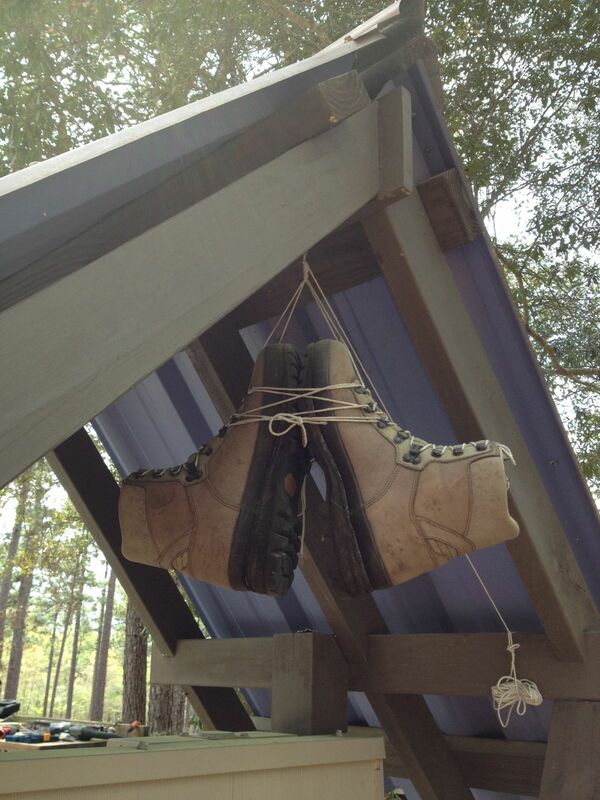 They really like nesting in these hiking boots. I deliberately built this little shed to exclude bird nests. But they still try to get roots and leaves and pine straw to balance on that 3/4" wide ridge board. They are entirely unsuccessful. The material just rains down onto the ground. After a while their stoic efforts started to make me feel mean so I hung up these too-heavy hiking boots for them. They built nests in both of them immediately. This year I have a lot of longleaf pine wood scraps under a foot long. I hate to waste them, but they aren't good for much. I decided to make a lot of birdhouses. 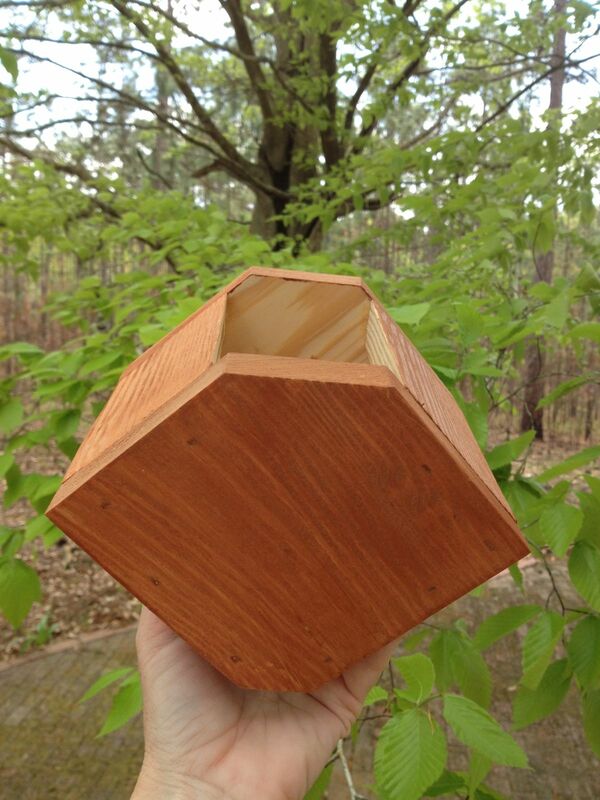 There is a standard proven wren box that works with wood this size, but I need something bigger for the roof. I started experimenting with all the things I had around. After I got 6 prototypes I decided to do an experiment to see which roof strategy deserved further work. I put all the birdhouses on my clothesline which runs East-West. The line-up is random. In order they are v4, v3, v5, v1.1, v2, v6. The control temperature is the bark on the shady side of the tree holding up the clothesline. 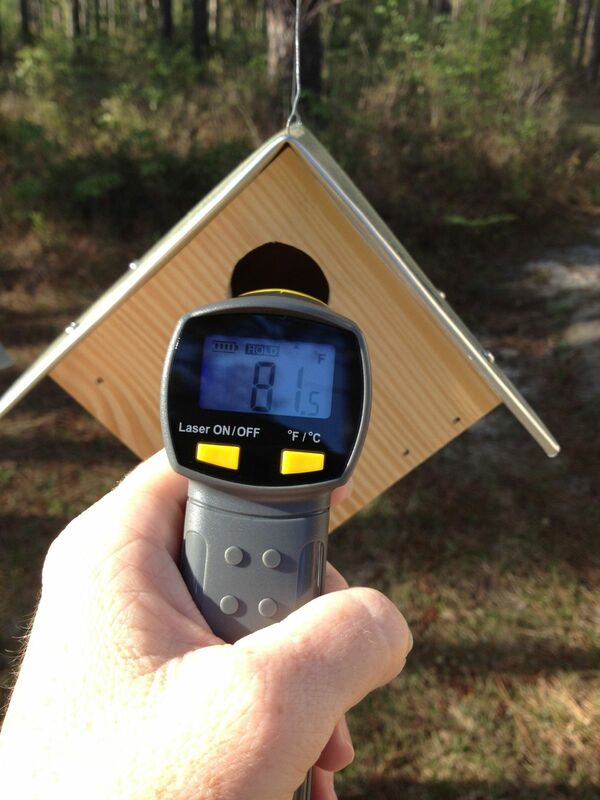 I faced the holes South so I could measure the temperature inside the box by aiming an infrared thermometer at the inside of the North wall of the box, like this. I planned to go through 24 hours taking a few measurements an hour during the interesting daytime hours and a few at night to keep the chart realistic. The mosquitoes are very bad right now. I started measurements about 5:00 Monday afternoon. I got 12 sets of measurements. When all the boxes were about the same temperature I stopped going out. I have a mosquito net that goes over a hat but they got inside it when I went out at 11:15. That was it for me. Tuesday morning I got up at sunrise excited to see how fast the boxes would warm up as the sun hit them. They are all free to blow around and bounce and turn. The shadows move across them through the day. That's why I wanted to do so many measurements, so it all evens out. When I went out to do my 6th set of measurements at 9:30 there was a root hanging out of the hole of the easternmost box. The one next to it had a grass seed head poking up out of it. When I went out at 9:58 the third one from the East had a nest started in it too. I watched from the bathroom windows and saw two wrens at the same time. I think one was building one nest and the other was building two. Wait! You can't have your babies there! This is just temporary! so I could see if the wren would reuse the material. He did. Where do they get those skeleton leaves? Which birdhouse will he go to? He's over the middle of the three in use. The first one! See him perched on the little Quickgrip clamp? an S-hook and chain just to rig it for the experiment. This the only box with boards inside the front and back at the top. This reduces the inside volume. No proof yet that a wren will pass on it. Version 6.0 Stained 6 sides 1x4 over vinyl flashing with drilled side vents but no ridge vent, bottom drain slot. Off-center hole, wall mount. Hole is off-center for structural reasons. V 6.0 is the box the wren filled with the most material today. He loves this box! So that's it for the individual boxes. The aluminum roof heats up faster and cools off faster, which I expected. I thought the thermal mass of the Hardishingle would cause it to lag more than it did. It isn't enough of a thermal improvement to be worth the extra weight and effort to screw it down. It looks like the stain increases the external temperature a lot, as does insulation underneath which stops it cooling to the inside. The insulation seems to make a big difference in the wood roofed boxes. 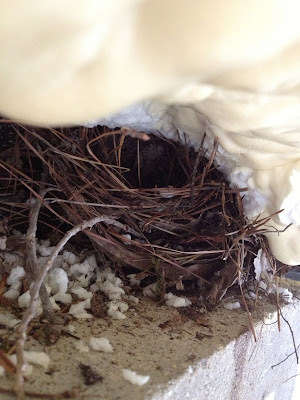 I want to experiment with styrofoam insulation now (because I have some). 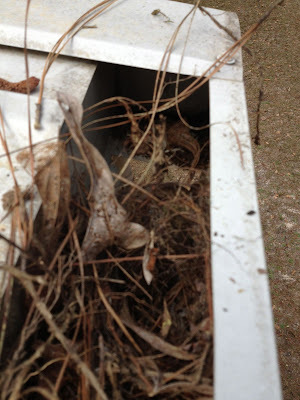 I think the galvanized roof box is probably safe for birds. Any of the wood roof versions is fine. I like the one with the off-center hole that the wren liked the best. I'm going to try making more of that kind with the addition of corrugated plastic, this time between the vinyl flashing and the wood, like a warm roof. Here's a scatter chart. I wanted to see the data points in the straight part of the line. Crate and Barrel has an all ceramic birdhouse selling for $69 in the catalog I received the other day. Of course, you know what is wrong with a ceramic birdhouse!? Why, it's the same thing as what's wrong with a teapot on a swinging shelf. Somehow, some way, it's gonna break easily. And, there goes $69 down the tube! I like yours better. For looks, I like 5.0 the best. Thanks! A lot of people have said they like that one. It is the most unique. I'm going to make a lot of that kind. I got electric shears to cut the metal roof. Bzzzz, bzzzz.......I predict a lot of vibrations in your future! Ha! Vibrating hand tools always make my hands itchy!